“If they break them, we fix them”, said Brian Kettering of Clippard Instrument Laboratory, regarding the accidents that occurred during the Queen City FIRST regional robotics competition held in Cincinnati, Ohio, March 24-27, at Cintas Center on the campus of Xavier University. Fifty-five teams were entered in the competition representing nine states, plus a team from Canada and China. 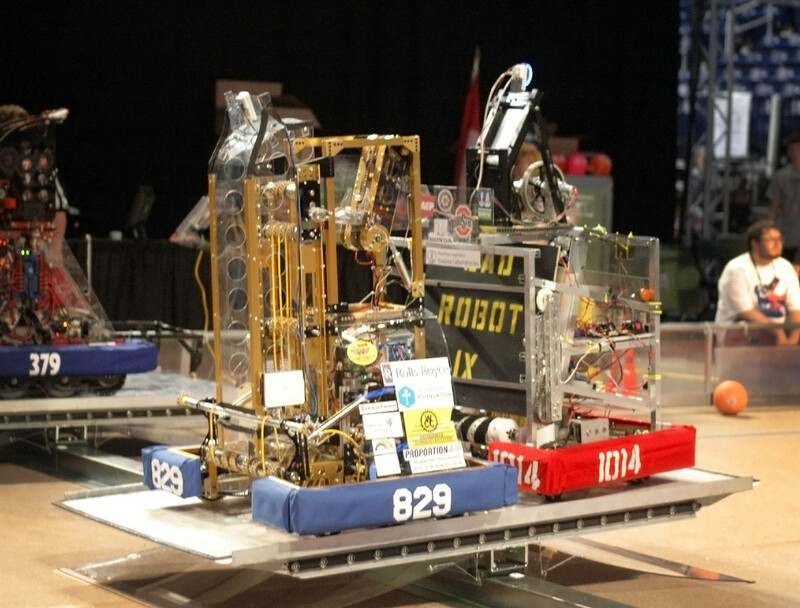 The three day event saw over 1,000 students compete for the chance to move on to the district and ultimately the FIRST Robotics Championship to be held in St. Louis, Missouri. Several people from Clippard were in attendance to cheer-on the local favorite, Colerain High School. Kettering, along with Kyle Shearer of Clippard, were there to assist any team that needed repair of rails, bumpers, arms, or just about anything that needed repair. A make-shift machine shop, including welders, enabled the volunteers to make the repairs and according to Kyle, they stayed pretty busy throughout the competition. They also noted the level of structural design and expertise was wide ranging. Brian recalled how one of the robots used 2x4 lumber to construct the frame and bumpers. Yet another incorporated a sophisticated directional control unit that allowed it to easily outmaneuver the others. According to Brian, who volunteers at the high school during the fabrication process, he and Kyle were very impressed with the students’ designs and level of mechanical knowledge, plus the comradery and spirit of the teams an spectators. Both Brian and Kyle noted that the level of success seemed to be directly proportionate to the amount of work and effort invested in each robot, but not always (their favorite didn’t win). Success of the FIRST Robotics program depends on the many companies, organizations and volunteers who contribute their time, effort and material. Through these efforts and contributions, FIRST is able to continue to expand and offer thousands of students a means to grow in science and applicable technology. Congratulations to all participants and volunteers!